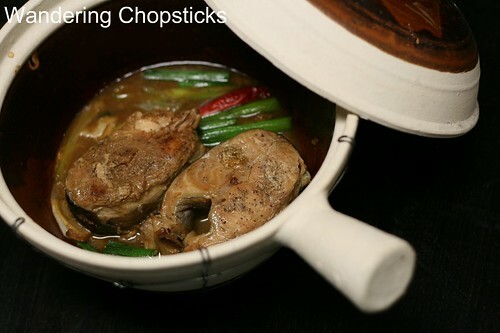 I had never been particularly pleased with my original post for Ca Kho To (Vietnamese Braised Fish in a Claypot). Partly because I didn't have a claypot in the original photo and partly because I had made it with tuna instead of catfish, my preferred fish for this dish. I wasn't enamored with my original entry for this dish either, but posted it anyway. The only adjustments I've made to the recipe, actually for most of my braised dishes, is to substitute Indonesian kecap manis for the Nuoc Mau (Vietnamese Caramel Sauce). I always have a bottle of kecap manis on hand, it's dark and it's sweet - all qualities of nuoc mau but waaay easier. This recipe has been sitting in my queue for practically a year. Not sure why I never got around to posting it except that there's no story attached. It's just one of those homey Vietnamese dishes that I don't make nearly as often as I should. I made this last May 24 to be exact. Hence, the poor photos since I have a slightly better camera now, my amateur photography skills are marginally better these days, and I finally have a dining table to take pictures on. All that aside, I have lots more Vietnamese recipes that are just waiting their turn. I really should post more Vietnamese recipes though because they're the most popular ones on my blog. So hopefully you'll forgive me for the not-so-great photos since I'm giving you the recipe? Slightly different versions of ca kho to can be found all over Vietnam, depending on which region you're from. I've included my basic recipe, along with suggestions for some variations. The key is the caramelized sugar and braising, which creates a slightly sweet, deeply rich flavor. Don't be intimidated by the caramelizing process. It's simply burning sugar so you can't go wrong. :P Some Vietnamese make a large batch and keep it on hand when they cook. Caramelizing is so quick and easy though that I prefer making fresh amounts when a recipe calls for it. You can skip this step entirely if you wish, and the dish will still be quite tasty. Typically, catfish is used in this recipe, but I used tuna with excellent results. Cut the fish into steaks rather than fillets so it can better withstand the long braising time. A to, or claypot, is rather like the Asian version of the Dutch oven. 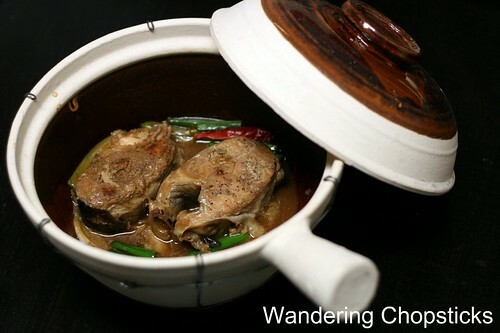 The thickness of the claypots retain heat and moisture, helping to soften meats when braised. A claypot isn't required for this recipe, but if you'd like to purchase one, they can be found at most Asian grocery stores. My 9-inch claypot was about $6. Optional: bacon or pork belly, fresh coconut juice or Coco Rico, 1 or 2 tblsp peanut butter, chili, scallions. Wash fish steaks and set aside to drain. In a bowl, mix 1 tblsp fish sauce, 2 tsp brown sugar or honey, 1 tsp black pepper, 1/2 tsp salt, 3 cloves minced garlic, 3 minced shallots. Taste and adjust seasonings if necessary. Make Nuoc Mau (Vietnamese Caramel Sauce) or skip and use 2 tblsp kecap manis. When the sugar caramelizes, it'll start hardening so add 1/2 cup water and stir. Then add the marinade and fish steaks. Turn the heat down to medium-low, cover, and let simmer for about half an hour. After 15 minutes, make sure to flip the fish to make sure both sides soak in the marinade. Also, check and see if the marinade has dried out and add water if necessary. Leave the cover off so the marinade can thicken and form a sauce. Variations: I sometimes add two bacon strips to my recipe for that extra touch of unctuousness. If you'd like to do the same, cut the bacon into strips and saute until crispy. Set aside to drain. Add the bacon into the pan when you add the fish. I also replaced the 1/2 cup of water in the caramel sauce with fresh coconut juice or Coco Rico. You can also add 1 or 2 tblsp of peanut butter if you'd like a Thai-flavor dimension. My mom likes to do this with mackerel. Chilies and scallions can also be added if you'd like. Serve with plain jasmine rice and plain boiled or sauteed vegetables. The ca kho gravy is perfect to spoon over rice. Or roll the catfish with herbs and noodles in rice paper. Add a spoonful Tuong Ot Toi (Vietnamese Chili Garlic Sauce) to the gravy and you have the perfect dipping sauce. And let's take a look at my old photo that just didn't please me, yet I posted the recipe anyway. The taste is just as good, but presentation is a whole lot better. 1 year ago today, an American classic - the Coke Float. i love it when my mom makes this. i still am a bit hesitant of the carmelizing process but you make it sound so easy and simple. may have to try it on my own one day. but we love to do this with salmon. only time my mom uses catfish is when it is whole which isnt readily available here in NC. I've never tried this with anything other than catfish. The tuna looks great - probably healthier (?) than catfish too. Thanks for reminding me. I've added it to the post. I've never could work out the carmelizing sugar part, always comes out too bitter. I will have to try your method, sounds simple. My mom makes a variation with canned pineapple chunks and the sugars in the pineapple melds with the caramelized sugar sauce very well. If it's a little overburnt, just add sugar and water to balance it out. Pineapple sounds like a great variation as well. I've tried this recipe and b/f loved it. 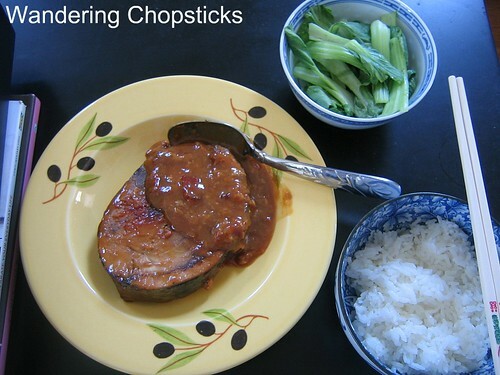 I've also tried a different recipe of Ca kho to from different website but didn't like it. I like yours alot better. thanks for sharing your recipes! Ah, that's nice to hear! Well, I think it's a matter of finding someone whose tastebuds are similar to yours. Or maybe my recipes are just better? Ha! :P The funny thing is that I was making fish today and debating between re-doing this recipe or making fish noodle soup. I ended up doing the latter instead, although I do intend to tweak this recipe a bit. I do have more fish recipes, guess I should post them soon. The steamer is great for fish and veggies too. Can't really overcook things that way. Oh dear, were you trying the engagement chicken? Maybe bf knows about the story and doesn't want to admit he likes it? Haha. hey awesome recipe but it was a little hard to read the post since everything wasn't separated into a list (ingredients, etc.). I kept losing my spot when reading the directions, but all-in-all this was a great dish! I didn't know what you meant by ingredients not being in a list, but I totally get it now. Stupid Blogger has been messing up with the format of my old posts and lumping everything together into one big block of text. I've been fixing what I can, but it's all over the place. Glad you persevered and liked the recipe!